In recent years, the popularity of cruising in China has reached an all time high, with thousands of international passengers visiting the country by sea each year. This has led to massive investment in cruise ship infrastructure at several ports along the Chinese coast, as well as the arrival of several Western cruise lines to the region. Of all China’s successful cruise destinations, none compare to Hong Kong in terms of culture, vibrancy and sophistication. Now boasting two state-of-the-art cruise terminals, Hong Kong looks set to become one of the busiest cruise terminals in the world over the coming years. But what can international cruise passengers expect during their first visit to the so-called ‘Pearl of the Orient’? To find out, Cruise1st Australia has partnered with the Hong Kong Tourist Board to provide help and insight for those interested in visiting this incredible city. Here, we chat to the HK Tourist Board about what passengers can expect during their inaugural visit. 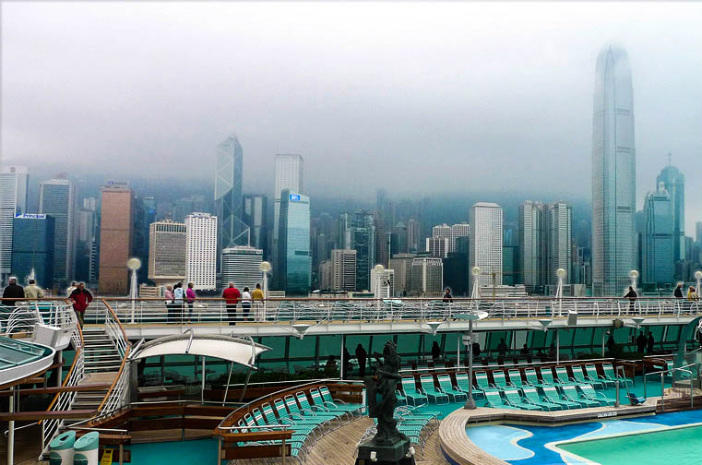 What can Australian cruise passengers expect during their first visit to Hong Kong? As a cruise port, how does Hong Kong differ from other destinations in Asia, and what does it do better? With their state-of-the-art facilities and ease of access, Kai Tak Cruise Terminal and Ocean Terminal deposit you close to all the action in Hong Kong. Arriving at Ocean Terminal puts you in the heart of Hong Kong as you step into one of the city’s most cosmopolitan and vibrant shopping and dining districts – Tsim Sha Tsui. Ocean Terminal is itself a major shopping complex. As part of the major shopping complex, you’ll find 450 retail shops, 50 restaurants, cinemas and hotels. And nearby, culture fans will find the Hong Kong Cultural Centre, Hong Kong Museum of Art and Hong Kong Space Museum. Located at the former Kai Tak Airport runway, the Kai tak Cruise Terminal is one of the world’s foremost cruise terminals. The three-storey building features light-filled passenger and service areas, efficient passenger circulation between drops-offs, waiting halls, concourse, jaw-dropping views of Victoria Harbour and an impressive slew of amenities. The terminal will be able to accommodate two mega cruise ships with a gross tonnage of up to 220,000 tons when fully commissioned. Above the terminal, you’ll find the largest rooftop garden in Hong Kong. Covering an area of 23,000 square metres, the Kai Tak Cruise Terminal Park features a central lawn, water garden, fountain plaza and viewing platform from which to take in the incredible views of both Hong Kong Island and the Kowloon. What would you say are the three must-see attractions for those visiting Hong Kong for the first time? The view is what makes The Peak one of the most popular attractions in Hong Kong. By day your eyes stretch across sparkling skyscrapers and Victoria Harbour all the way to the green hills of the New Territories. In early evening this panorama melts into pink and orange before reincarnating as a dazzling galaxy of light, shimmering beneath you. With over 100 stalls of bargain clothing, accessories and souvenirs, the Ladies’ Market on Tung Choi Street, Mong Kok provides a one-kilometre stretch on which to practise your haggling skills. Temple Street Night Market, a popular street bazaar, sells trinkets, tea ware, electronics, watches, menswear, jade and antiques while claypot rice, seafood, noodles and other treats are consumed with gusto. How does Hong Kong cater to English speaking tourists, and where can holidaymakers find help and information during their visit? English is widely spoken in Hong Kong and is the language of preference in the government, business and tourism sectors. As a visitor, you can expect to encounter minimal problems communicating in English, as most taxi drivers, salespeople, tourism industry employees and police have reached competent levels of the language. Also, all official signs and public transport announcements, as well as most menus, are in both English and Chinese. The Hong Kong Tourism Board (HKTB) is ready to answer your questions and provide information about all the sights, sounds and happenings in Hong Kong. Pop into one of our Visitor Centres to see what’s going on, or to just say hello! If you had just 12 hours to spend in Hong Kong, how would you spend that time and why? The Hong Kong Island tour takes you to all the must-do spots on Hong Kong in just a few hours. Visit Victoria peak, Repulse Bay, the famous Stanley markets and Aberdeen Fishing Village. Are there any travel tips and advice you’d like to offer to those travelling to Hong Kong? Whilst in Hong Kong, make the most of the easy and efficient public transport system. Purchase the Octopus card and away you go. This is an extremely versatile stored-value electronic card that can be used for most public transport, as well as purchases in convenience stores, fast food shops, supermarkets, cake shops, vending machines and more. Has this interview whetted your appetite for a trip to Hong Kong? Then visit the Cruise1st Australia website, and use the search bar on the left to browse our selection of Hong Kong cruise breaks. Alternatively, give our friendly and knowledgeable team a call on 1300 306 318.